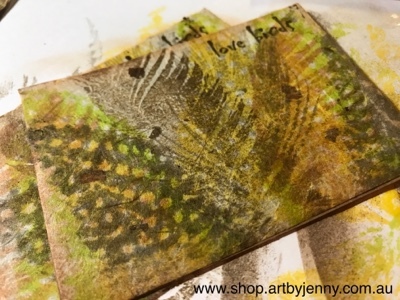 These ATCs were made for a swap with the FB Art Swap Group for the theme "Feathers". 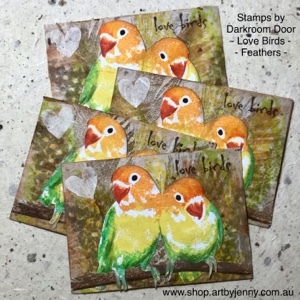 I used Darkroom Door stamp sets 'Feathers' and 'Love Birds' with Distress Inks, Liquitex mixed media paper and mulbury paper. Firstly I inked and stamped feather stamps onto the mulbery paper using Distress ink in Peeled Paint, Twisted Citron, Tea Dye and Peacock Feathers. I just kept inking and layering feathers until I liked what I saw. They had to be put aside to dry as I used so much ink! 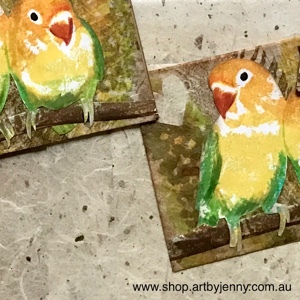 The love birds were inked with Squeezed Lemonade, Rusty Hinge, Twisted Citron and Peacock Feathers (with Pumice Stone for the feet) at the same time before stamping onto the mixed media paper. Normally I'd use my watercolour markers but my yellow is dry so used ink pads instead... not as accurate but it still worked. fyi... To refill Distress markers, pull out the brush nib, add a few drops of the same colour Reinker using the eye dropper then put the nib back in. Their beaks were coloured afterwards with Barn Door and the eyes with black Sharpie. Edges were inked with Pumice Stone... inking edges always seems to finish off pieces and lift them from the surface. The branch was inked with Walnut Stain and cut separately from the birds. 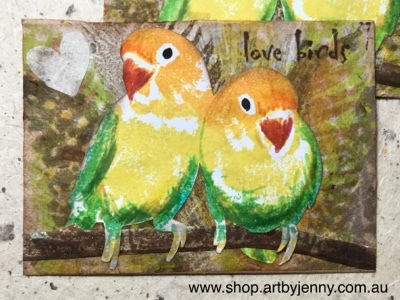 The words 'love birds' were stamped in black Archival ink. All were handcut (fussy cut) including the little heart (in mulbery paper) before sticking into place. Thanks for reading :) Hope they make you smile!